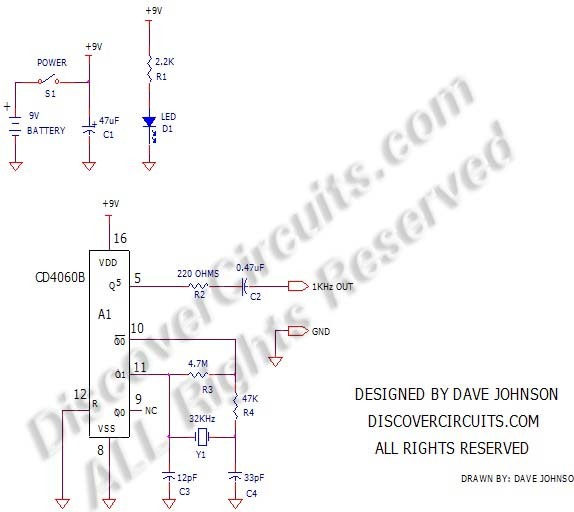 A while back I got an email from a Discover Circuits visitor. He needed a way to calibrate a RPM display for a big diesel engine. The engine had a tachometer output which produced 12 pulses per rotation with an Amplitude of about 5v RMS. The full scale reading on the engine’s RPM speed display dial was 5,000. This translates to a pulse frequency of 1KHz at full scale. To calibrate the display, he needed an accurate 1KHz signal. The 32KHz crystal controlled oscillator below performs this function. It uses a CD4060 binary counter, which has internal inverters configured for a classic crystal oscillator. The Q5 output divides the 32KHz crystal frequency by 32 yielding an output of 1KHz. The output is AC coupled to the input of the tachometer.